These Hoses have been Imported Form Germany, and these are High Pressure Hoses. Our Spradow Hoses are available for different lengths, the maximum is 2Meter long. Also available from Staniless steel ends. 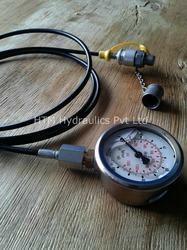 The Micro Bore Hoses can withstand a Pressure of 630 Bar. We feel immensely pleased to offer an excellent quality Microbore Hoses. This microbore hose is commonly used to connect to a minimess test point for pressure testing, has many diverse applications. The given microbore hose is checked on numerous parameters in order to deliver defect free range to customers. Our microbore hose is unique because it can be attached and detached without a wrench or thread sealant while maintaining a working pressure of 630 bar.